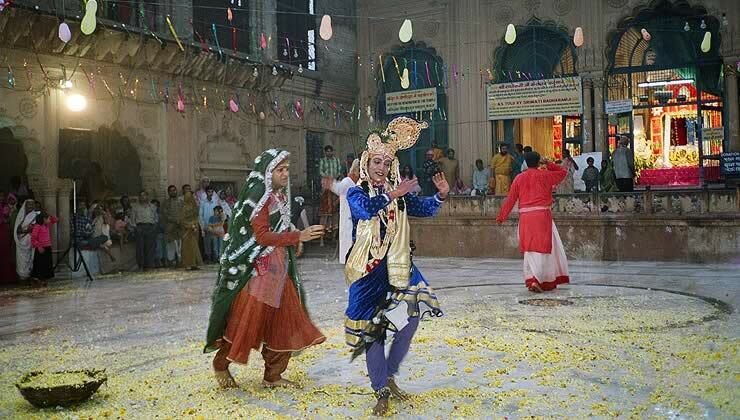 Actors portray the Hindu god Krishna dancing in the guise of a cow-herd with his beloved milkmaid Radha in the traditional folk play known as the Krishna leela. In India, dance, music, and drama are interconnected and share the influence of devotional religion. The foundation for many of India's performing arts traditions can be traced to the Natya shastra, a Sanskrit treatise on dance, theater, and music, written between the 2nd century BCE and the 2nd century CE. The arts were traditionally supported by the royal courts, palaces of the Hindu princely states, and major temples and religious centers. India's classical dance styles include bharata natyam, which developed in Tamil Nadu, and kathak, of northern India. Both forms incorporate stylized hand and arm gestures, along with elaborate footwork and facial expressions to tell stories and convey mood. Among the important dance dramas that originated in India are kathakali and Mohiniattam from Kerala, kuchipudi, from Andhra Pradesh, Odissi from Orissa and Manipuri from the North-Eastern state of Manipur. Kathakali is performed only by men and characterized by dramatic costumes, makeup, and masks which are used to re-enact episodes from the Hindu epics, the Ramayana and Mahabharata. Kuchipudi was originally performed only by men but is now dominated by women. Among its most popular subjects is the story of Krishna's jealous wife Satyabhama. Folk dances and plays, such as the ram lila and Krishna leela, which recount events from the life of Rama and Krishna, respectively, are also vital art forms. Bharata natyam is an Indian classical dance that originated in Hindu temples and is now one of India's most popular dance forms, taught and performed across the country and abroad. It was developed and fostered in Tamil Nadu, especially during the reign of the Chola kings, whose great temples maintained hundreds of devadasis (temple dancers). Development of the dance was continued by the rulers of succeeding dynasties into the 19th century CE. The devadasis were young women who were "married" to a particular deity and performed dances for the gods represented in the temple and for the enjoyment of the Brahmin priests. During the British Raj, the devadasis came into disrepute and their dances viewed as licentious. Temple dancing was legally banned in the state of Madras (now Tamil Nadu), but bharata natyam continues as a theatrical dance form starting in the mid-1930s and is now taught widely across India and the outside world. A solo dance performed mainly by young women, bharata natyam's choreography features an extensive vocabulary of formalized hand gestures (mudras), which carry distinctive meanings, accompanied by energetic rhythmic footwork, sculptural poses, and animated facial expressions. It incorporates three basic components of Indian dance: nritta (pure, rhythmic dance), nritya (expressive dance that conveys mood through facial expressions and hand gestures), and natya (pure storytelling that combines song and dance). The female dancer performs in bare feet with a large, wide anklet of bells and she wears an elaborate sari draped to form a cascade of pleats in the front, which fan out between the legs with her movements. A typical recital consists of six sections: the alarippu, an invocation to the deity and audience greeting; the jatisvaram, a technical piece that uses nritta; the sabdam that introduces nritya; varnam, the most complex piece that uses both nritta and nritya; padam, a piece expressing love and devotion through natya; and the final section, the tillana (or thillana), a fast-paced, rhythmic piece that showcases the dancer's mastery of intricate footwork and beautiful poses. One of two major Sanskrit epic poems in ancient Indian literature, the other being the Mahabharata, the Ramayana ("Life of Rama") is thought to have been composed in Sanskrit between 500 BCE and 200 CE by the sage Valmiki, who based his text on older stories. Like the Mahabharata, the Ramayana is a core text in Hinduism and illustrates Hindu virtues. In seven books, the epic recounts the story of Rama, a legendary prince and king of Kosala, and his perfect wife Sita. The work lends itself to an allegorical or spiritual reading in which Rama and Sita are incarnations of the deities Vishnu and Vishnu's wife Lakshmi. In Hinduism, Rama represents the ideal of an individual living life according to dharma, and Hindus today revere him as a deity: indeed in North India he is widely seen as the supreme deity. 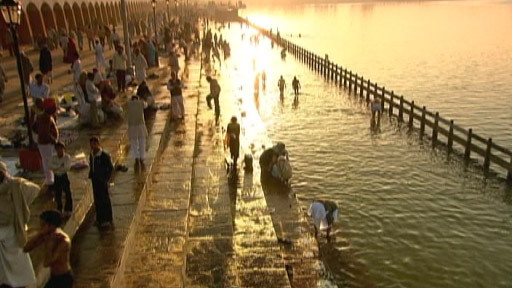 The epic takes place in Ayodhya, which since the 5th century CE has been identified with the city which bears that name today on the Gogra river in Uttar Pradesh state. After Prince Rama and his wife Sita are banished from their kingdom, Sita is abducted by a demon king, Ravana. Prince Rama saves his wife and defeats Ravana with the aid of his brother Lakshman and loyal friend Hanuman, along with his army of monkeys. Years later, Rama questions his wife's chastity during her abduction and exiles her to the forest, where she gives birth to twin sons and raises them in the poet Valmiki's ashram. Prithvi, the goddess associated with Earth, receives Sita into her underground kingdom as proof of Sita's innocence. The tale has been interpreted and reinvented by numerous cultures and continues to be an enduring work of art, with some three hundred of variations on the story in 20 languages across southern Asia alone. It has been claimed that the 78 episode Indian TV version aired in 1987/8 had the largest ever TV audience. The Mahabharata ("The Great Tale of the Bharatas") is one of two major epics in ancient Indian literature, the other being the Ramayana. The story first began in the oral tradition during the first millennium BCE and was composed in Sanskrit over centuries, beginning perhaps as early as 800 or 900 BCE, and reaching its final written form around the fourth century BCE. Attributed to the poet Vyasa, the epic is composed of nearly 100,000 verses divided into 18 books. The sixth book contains the central text of Hinduism, the Bhagavad Gita ("Song of the Bountiful Lord"), which discusses the four goals of life or purushartas—artha (worldly wealth and success), kama (pleasure and desire), dharma (righteousness), and moksha (knowledge and liberation from the cycle of birth and death). A dialogue between the warrior Arjuna and Krishna, the Bhagavad Gita makes dharma its central lesson: hesitating before the prospect of war, Krishna reminds the hero Arjuna of his selfless duty or dharma. Set in the kingdom of Kurukshetra on India's northern plains, the epic narrates a succession struggle among members of the Bharata ruling family that results in a ruinous civil war. The Pandava brothers are pitted against their rival cousins, the Kauravas, who divest the eldest Pandava brother of his kingdom and his wife in a fixed gambling match. The brothers are forced into exile for 13 years during which time they prepare for war with their cousins. The Pandavas prevail in an 18-day battle that causes great loss of life on both sides. In contrast with the Vedas, which are considered "sruti" or divine revelation, the epics are considered smrti ("that which is remembered") or of human origin. As part of the celebrations of the festival of Dusshera, performances of a popular folk play called the Ram Lila (Ramlila) are staged in cities and villages throughout northern India. The Ram Lila reenacts the Hindu epic the Ramayana (the story of Rama), is are typically presented over a 10-day period in September or October. The story's main roles are played by amateur actors, chiefly young boys, and the performances, which attract large audiences each year, feature music, spontaneous dialogue, and showy costumes, makeup, and masks. After the completion of the Ram Lila, the festival ends with the burning of giant effigies, often filled with firecrackers, of the villains of the Ramayana—the demon-king Ravana, his brother Kumbhakarna, and his son Indrajit (also known as Meghanada)—to mark the day that Rama defeated Ravana, signifying the victory of good over evil. 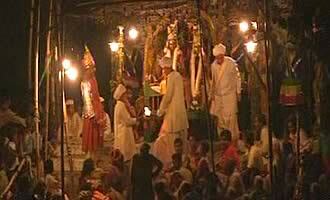 The Ram Lila that is presented in Ramnagar, near Varanasi, is the only one in India that takes place over a one month period. Instead of a single stage, sites are set up throughout the town to represent the key locations from the Ramayana and audience members follow the actors as they perform at the various spots. The text followed is a creation from the early 19th century based on the 16th century version and the story in Hindi by Tulsidas. Events from the life of the Hindu god Krishna are the basis of the folk plays (leelas) that are put on during the festival to mark his birth called Janmashtami, particularly in the cities of Mathura, his birthplace, and Vrindavan and Gokul, where he grew up. Professional and amateur troupes reenact important scenes from Krishna's childhood: as a mischievous baby who steals butter from the local villagers; as the handsome, young cowherd who plays pranks on the local milkmaids (gopis), but also wins their affections with his flute playing and by dancing with them in the forest, especially his favorite gopi, Radha; and as the warrior who slays the evil king Kans (or Kamsa). 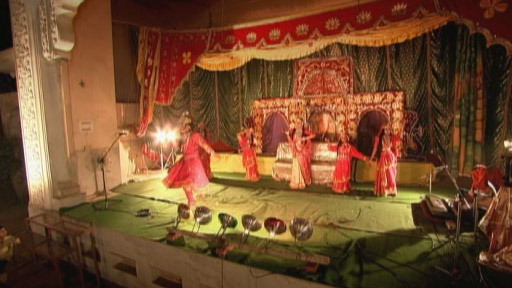 Inscriptional evidence dates the tradition of drama in Mathura back 2,000 years. The ideal son, ruler, and husband, Rama is, according to Hindu belief, the seventh incarnation of the Hindu god Vishnu, who came to earth to restore order to the universe by vanquishing the demon-king Ravana. 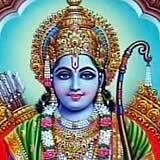 Rama was the eldest son of King Dasharath of Ayodhya and Queen Kaushalya. He had three half-brothers, Lakshman, Bharata (who also appears in Jain scriptures), and Shatrughna, sons of the king’s two other primary queens, Sumitra and Kaikeyi. 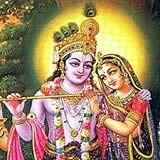 Rama won the hand of his wife, Sita, by being the only suitor who could string and wield a magical bow that had been bestowed on her father by the god Shiva. Rama was endowed with great strength, wisdom, beauty, and wealth but also humility, which made him beloved among his family members and the people of Ayodhya. He was the kingdom’s heir apparent until Queen Kaikeyi manipulated King Dasharath to make her son, Bharata, the successor and banish Rama to the forest for fourteen years. Rama’s exile and subsequent quest to defeat Ravana, who abducted Sita, and regain his rightful kingdom is chronicled in the Hindu epic poem the Ramayana. Rama’s actions throughout his many trials make him the exemplar of reason, strength, and rectitude, and consequently, he has become one of the most venerated Hindu deities. He is commonly represented as a standing figure, with an arrow in his right hand and a bow in his left, attended by his faithful wife, Sita, devoted half-brother, Lakshman, and loyal friend, Hanuman. What role does dance play in Indian culture? How did the British view the devadasis? How did British and Indian views of the devadasis differ?